Herbaspirillum rubrisubalbicans was first identified as a bacterial plant pathogen, causing the mottled stripe disease in sugarcane. H. rubrisubalbicans can also associate with various plants of economic interest in a non pathogenic manner. A 21 kb DNA region of the H. rubrisubalbicans genome contains a cluster of 26 hrp/hrc genes encoding for the type three secretion system (T3SS) proteins. To investigate the contribution of T3SS to the plant-bacterial interaction process we generated mutant strains of H. rubrisubalbicans M1 carrying a Tn5 insertion in both the hrcN and hrpE genes. H. rubrisulbalbicans hrpE and hrcN mutant strains of the T3SS system failed to cause the mottled stripe disease in the sugarcane susceptible variety B-4362. These mutant strains also did not produce lesions on Vigna unguiculata leaves. Oryza sativa and Zea mays colonization experiments showed that mutations in hrpE and hrcN genes reduced the capacity of H. rubrisulbalbicans to colonize these plants, suggesting that hrpE and hrcN genes are involved in the endophytic colonization. Our results indicate that the T3SS of H. rubrisubalbicans is necessary for the development of the mottled stripe disease and endophytic colonization of rice. Herbaspirillum rubrisubalbicans was originally described as the causal agent of mottled stripe disease in sugarcane (Saccharum oficinarum) but it can also cause red stripe disease in some varieties of sorghum (Sorghum bicolor) [1–5]. The mottled stripe disease was first described in Louisiana (USA) in 1932 and is characterized by the development of red streaks with white spots on the leaves of sugarcane. It is a disease of relatively small economic importance and affects sugarcane varieties B-4362 and Taiwang [3, 6, 7]. Inoculation with high numbers of H. rubrisubalbicans cells in the stems of the susceptible varieties cause typical symptoms of the disease. The point of injection becomes red and necrotic and, after seven days, red stripes are formed along the vessels near the inoculation site, accompanied by different degrees of chlorosis. At this stage the bacteria infest the protoxylem and the metaxylem of the leaves. On the twentieth day the bacteria block both xylem lumen and there is necrosis around the inoculation point . The extensive bacterial colonization results in the expansion of intercellular spaces and subsequent compression of the host plant cells. Bacterial cells can eventually move from the vessels into the surrounding mesophyll, reaching the stomata and reducing the photosynthetic activity and lifetime of the leaves. Host plant responds with the production of phenolic compounds, gum, and localized cell death . H.rubrisubalbicans can cause symptoms of red stripe disease on sorghum leaves of some cultivars after artificial inoculation. This mild disease is characterized by red stripes along the veins of the leaves near the point of inoculation, and these leaves showed dense colonization by H. rubrisubalbicans at 5 days after inoculation. H. rubrisubalbicans is restricted to the metaxylem, protoxylem and associated lacunae, which are completely filled with bacteria; this behavior is different from that observed in mottled stripe disease, where the bacteria escaped from the vascular system to the adjacent mesophyll and substomatal cavities destroying chroplasts, and revealing the mottled background [1, 5]. H. rubrisubalbicans is also known as a PGPR (Plant Growth-Promoting Rhizobacteria). This bacterium is a component of the bacterial consortium developed by the Brazilian Agricultural Research Company (EMBRAPA) and recommended as a commercial inoculant for sugarcane [8–10]. The genes of the type three secretion system (T3SS) were first identified as hypersensitivity response and pathogenicity (hrp) genes in the phytopathogenic bacterium Pseudomonas syringae by Lindgren et al. . Subsequent studies showed that the hrp genes of P. syringae were located in a cluster of 25 Kb. Similar gene clusters were also found in other phytopathogenic organisms [11–13]. Several hypersensitive response and pathogenicity genes of plant pathogens are homologous to genes of animal pathogens that encode components of the T3SS [14, 15], and were named hrc (HR conserved) . The T3SS is present in Gram-negative pathogens of animals and plants, and was then described in symbiotic , saprophytic and associative bacteria [18–20]. The T3SS consists of a secretion apparatus that delivers a series of effector proteins  across the inner membrane, the periplasmic space and outer membrane of bacteria into the eukaryotic cell cytoplasm. The effector proteins manipulate and control the host cell metabolism to the advantage of the pathogen and to repress defense mechanisms. Analyses of a partial genome sequence of H. rubrisubalbicans revealed the presence of genes homologous to the T3SS. 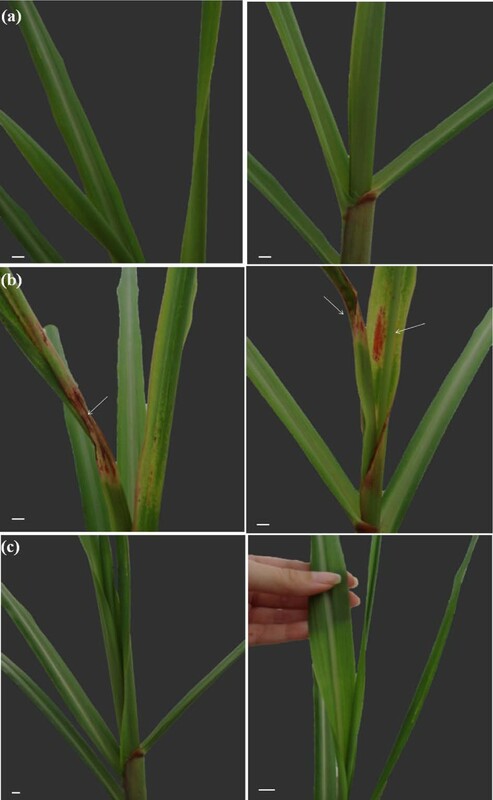 In this work we show that H. rubrisubalbicans T3SS is necessary for the development of the mottled stripe disease in sugar cane and also for endophytic colonization of rice. The hrp/hrc genes cluster of H. rubrisubalbicans M1 contains 26 genes distributed in a 21 kb region, composed of seven hrp, eight hrc, and eleven genes encoding for hypothetical proteins (GenBank accession JN256203) (Figure 1). Based on partial homology we found that most of the genes in this cluster encode structural proteins of the T3SS, that are involved in the construction of the base and the injectiossome. Genetic organization of type III secretion system from Herbaspirillum and other phytopatogens . Comparison of T3SS gene clusters from H. rubrisubalbicans M1 (JN256203), H. seropedicae SmR1 (NC014323), Ralstonia solanacearum CFBP 2957 (FP885907 - plasmid RCFBPv3_mp), Xhanthomonas campestris pv campestris (AE008922), Pseudomonas syringae pv tomato DC3000 (AE016853) and Erwinia amylovora ATCC49946 (FN666575). The hrc and hrp gene designations are sometimes replaced with c and p, respectively in H. rubrisubalbicans and other plant associated bacteria. Homologous genes are in the same color; gray genes encode hypothetical proteins found from H. seropedicae and H. rubrisubalbicans; dark blue genes encode proteins with no homology with H. rubrisubalbicans proteins. Comparison of the DNA sequence of the hrp/hrc cluster of H. seropedicae SmR1 with H. rubrisubalbicans showed that the genes are almost identically arranged (Figure 1). However, aminoacid sequence comparison of the proteins encoded by the hrp/hrc genes of both organisms showed that only five out of 26 proteins have more than 70% identity (Additional file 1: Table S1). The degree of identity between each of the deduced H. rubrisubalbicans hrp/hrc proteins and its counterpart from H. seropedicae ranged from 11% (hypothetical protein 6) to 86% (HrcS), and the respective similarity varied from 17 to 97% (Additional file 1: Table S1). The structural organization of hrcUhrcThrcShrcRhrcQ and hrpBhrcJhrpDhrpE genes of H. rubrisubalbicans resembles that of H. seropedicae, Pseudomonas syringae, Erwinia amylovora, and Pantoea stewartii (Figure 1). Two genes, hrpL and hrpG (JN256211), which probably encode the regulatory proteins HrpL and HrpG may be responsible for the regulation of T3SS genes. In the region upstream of hrpL no σ54-dependent promoter was found, in contrast to what was observed in the hrpL promoter region of Pseudomonas syringae pv. maculicola [22, 23]. The hrpL gene is located at one end of the hrp/hrc gene cluster while hrpG is located approximately 10 kb downstream from the hrcC gene at the other end. 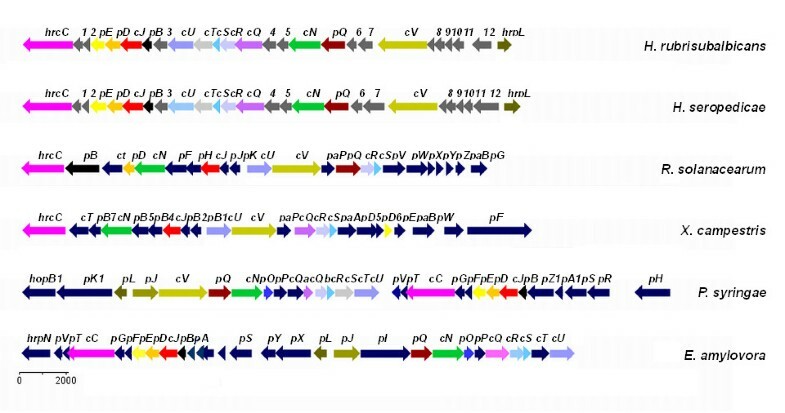 Within the Betaproteobacteria subdivision two groups of T3SS-containing organisms are observed concerning the conservation of gene order in the T3SS gene cluster members of group I include Erwinia sp., Pantoea sp., Pectobacterium sp., and Pseudomonas sp. This group includes only Gammaproteobacteria, thus far, suggesting that it is taxonomically uniform. All members of this group contain the hrpL gene, that encodes a sigma factor. Group II include representants of the Betaproteobacteria such as Ralstonia sp., Burkholderia sp. as well as Gammaproteobacteria, such as Xanthomonas sp. This group lacks hrpL gene but also contains HrpB or HrpX, which are transcriptional regulators of the AraC family . Phylogeny of hrcN gene revealed that those organisms form monophyletic groups (Figure 2). Both H. seropedicae SmR1 and H. rubrisubalbicans M1 contain the hrpL gene and show T3SS gene organization similar to that observed in organisms of the group I. However, the phylogeny of hrcN gene shows that, the two Herbaspirillum species clustered closer but outside from members of the group I-hrcN cluster (Figure 2), suggesting a distant evolutionary relationship and supporting a hybrid system as suggested by Pedrosa et al. for H. seropedicae SmR1, what may partially explain the differences observed in gene organization and similarity among Herbaspirillum sp. and group I bacteria. Phylogenetic tree from hrcN gene sequences from Alpha and Betaproteobacteria representants. Organisms of group I and II share similar T3SS gene cluster organization. The tree was built using the Maximum-Likelihood method with the Tamura 3-parameter model, gamma distributed rates and invariant sites (see Material and Methods for details). Bootstrap values are shown as percentage (>50%) from 1,000 replicates for each node. The tree is unrooted tree. Scale bar represents number of nucleotide substitutions per site. GenBank accession numbers are in parenthesis. Sequences similar to the HrpL-dependent promoter consensus (GGAACC-N15-CCACTCAAT) [26–29] were detected upstream from orf1, orf6, hrpO, orf8, hrpB and orf10 (Figure 3a, b). The ORFs from orf8 to orf9, from hrpB to hrpE and from orf10 to hrcC overlap or are spaced by less than 94 nucleotides apart, suggesting that these three groups of genes are part of three distinct operons. The ORFs from orf6 to hrcN appear to belong to the same operon, although a 114 bp gap is found between orf6 and orf7, but no promoter was found upstream from orf7. Likewise, the intergenic regions orf1 orf2 and orf3 orf4 contain 336 bp and 249 bp, respectively, but no promoter sequence was identified. This analysis suggests that H. rubrisubalbicans hrp/hrc genes are probably organized in six HrpL-dependent operons. (a) Putative promoter sequences of the orf1,orf6, orf8, hrpB and orf10 operons and hrpO gene of H. rubrisubalbicans. (b) Schematic conserved nucleotide bases found in the promoter regions – H. rubrisubalbicans Hrp-box. Two Hrp associated genes called hpaB (JN256204) and hpaB1 (JN256205) encode general T3SS chaperones, which promote secretion and translocation of multiple effectors proteins . The hpaB and hpaB1 genes are predicted to belong to the TIR chaperone protein family. The hpaB1 gene was found approximately 12 kb downstream from the hrcC gene and it encodes a small acidic chaperone. Type III secretion systems have been characterized in a variety of plant pathogenic bacteria. The structural proteins of these systems are highly conserved, but the T3SS effector proteins, that play a central role in virulence, are less conserved and difficult to identify. A BlastX search of the H. rubrisubalbicans partial genome sequence (30%) against NCBI-nr database allowed identification of five candidates of H. rubrisubalbicans effector proteins HropAN1 (H. rubrisubalbicans outer protein) (JN256208), HropAV1 (JN256209), HropF1 (JN256210), Hrop1 (JN256206) and Hrop2 (JN256207) (Table 1). Hrop1 and Hrop2 were also identified as T3SS effectors by the program EffectiveT3 (http://www.effectors.org/) . The genes encoding these proteins are located apart from the hrp/hrc genes cluster. The T3SS putative effectors were identified by BlastX and EffectiveT3 (http://www.effectors.org/) (Arnold et al., 2009). The proteins HropAN1 (H. rubrisubalbicans outer protein), HropAV1 and HropF1 are similar in sequence to HopAN1 (Burkholderia sp. ), HopAV1 (Ralstonia solanacearum) and XopF1 (Xanthomonas oryzae), respectively. Hrop1 is homologous to a type III effector protein from Ralstonia solanacearum MolK2. Hrop2 belongs to the leucine-rich repeats (LRRs) ribonuclease inhibitor (RI)-like subfamily . The genes encoding HropAV1 and Hrop1 immediately upstream of the hpaB1 gene, and outside the main T3SS gene cluster. 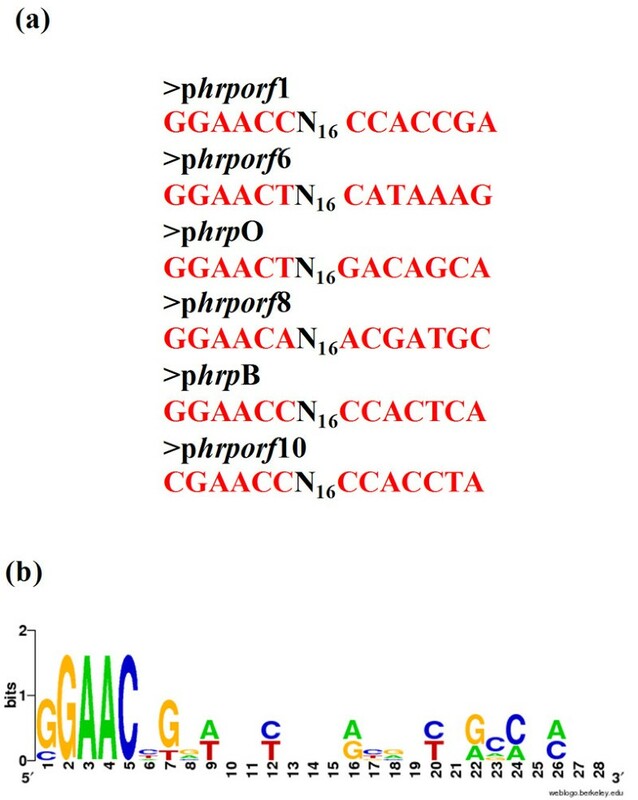 The H. rubrisubalbicans HrpB protein is homologous (identity 27%/similarity 48%) to the Pseudomonas syringae HrpB protein that is secreted and contributes to elicitation of the hypersensitive response in Nicotiana tabacum and Nicotiana benthamiana . This similarity suggests that H. rubrisubalbicans HrpB is a candidate for a secreted protein. H. rubrisubalbicans hrpE and hrcN genes are essential for the development of mottled stripe disease in sugarcane variety B-4362. To investigate the contribution of T3SS to the plant-bacterial interaction process we generated the mutants TSN and TSE of H. rubrisubalbicans carrying Tn5 insertions in the hrcN and hrpE genes, respectively. H. rubrisubalbicans HrcN protein contains 442 aminoacids and is homologous to T3SS-associated ATPases. The H. rubrisulbalbicans HrpE protein contains 202 aminoacids and belongs to the YscL/FliH family of cytoplasmic proteins . The wild type M1 and the mutant strains TSN and TSE were inoculated into the susceptible sugarcane variety B-4362. After 15 days, strain M1 caused typical symptoms of mottled stripe disease (mottled background with red stripes and red patches) and well-developed signs of necrosis in leaves invaded by bacteria (Figure 4a). In contrast, the mutants TSN and TSE did not elicit disease symptoms (Figure 4b,c). These results indicate that hrpE and hrcN gene products are required for the expression of visible symptoms of mottled stripe disease in sugarcane leaves variety B-4362. Inoculation of sugarcane variety B-4362 with wild type and hrpE mutant strains of H. rubrisubalbicans. 120 days after germination, 5 sugarcane plants variety B-4362 were inoculated with 10 mM of MgSO4 (a), H. rubrisubalbicans M1 (0.5 – 1.0x108 cells) (b) and H. rubrisubalbicans TSE (0.5 – 1.0x108 cells) (c). The photos were taken 15 days after inoculation (135 days after germination). The arrows indicate bacterial inoculation site and symptoms of the mottled stripe disease (b). The scale bars are shown (1 cm). Samples of B-4362 leaves inoculated with the strains M1, TSE and TSN were analyzed by light microscopy (LM) and transmission electron microscopy (TEM). 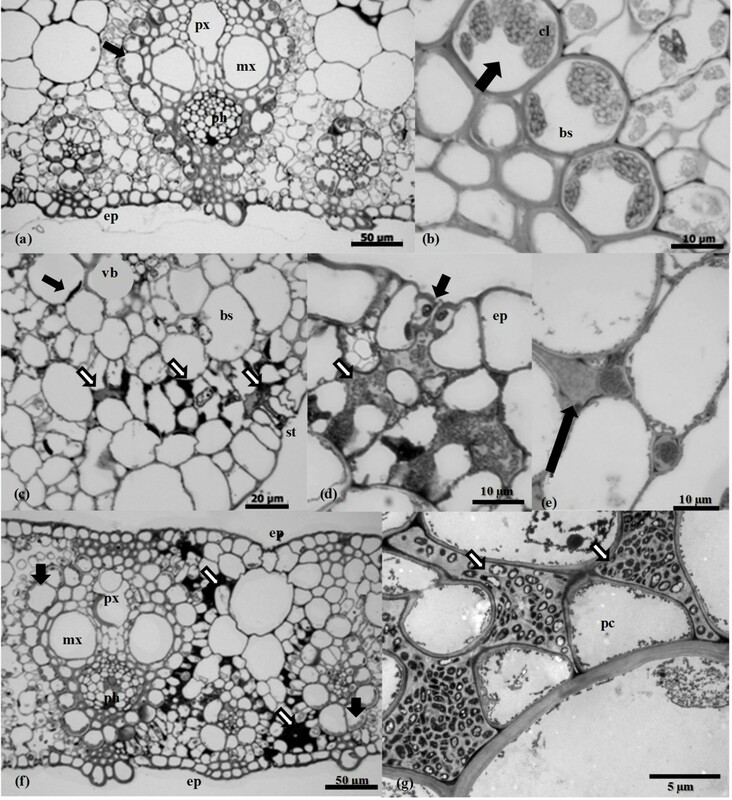 Cross sections of the control leaf did not have any visible symptoms and showed the expected anatomical organization for sugarcane foliar blades (Figure 5a). Detailed views of the bundle sheath layer showed chloroplasts of regular shape, distribution and appearance (Figure 5b). In contrast, leaf blades developing symptoms of the mottled stripe disease (inoculated with M1) showed disorganization of the parenchyma tissue characterized by cell wall swelling, hypertrophy and degradation of chloroplasts in both the bundle sheath layer and radial mesophyll cells (Figure 5c). These tissue alterations were associated with extensive colonization of the intercellular spaces of the mesophyll and sub-stomatal cavity by H. rubrisubalbicans strain M1 which were surrounded by gum, strongly stained with toluidine blue (Figure 5c,d). In contrast to the wild type (M1), both H. rubrisubalbicans mutant strains were not frequently seen in different serial cross sections of the leaf blades. Although all the strains had the same pattern of mesophyll colonization described above (Figure 5c), TSE and TSN mutant strains colonized the leaf blade less extensively. Moreover, more plant gum was present, an indication of an effective host defense which apparently restricted the intercellular spreading of both mutants (Figure 5e). Interestingly, even in areas densely colonized by the mutants, the plant tissue showed only minor anatomic changes, preserving the shape and sizes of the parenchyma cells and vascular bundles (Figure 5e). However, the apoplastic colonization by the mutant strains reduced the numbers and sizes of the bundle sheath chloroplasts and produced changes in the cytoplasm and nuclei of plant host cells in close contact with the bacteria (Figure 5f, g). Taken together these results suggest that although the qualitative pattern of bacterial colonization was not affected, the T3SS is necessary for extensive colonization and to induce plant tissue changes which lead to mottled stripe disease symptoms. Light microscopy (LM) and transmission electron microscopy (TEM) of sugarcane leaf blades variety B-4362 inoculated with H. rubrisubalbicans M1, TSE and TSN. (a) Transversal section showing the regular tissue organization of a control plant. (ep) epidermis layer, (px) protoxylem, (ph) phloem, (mx) metaxylem, (bu) buliform cells, (arrows) bundle sheath layer with healthy chloroplasts. (b) Detailed view of the bundle sheath layer (bs) showing its chloroplasts (cl) with regular shape, distribution and appearance (arrows), and (pc) parenchyma cells. (c) Typical pattern of colonization of H. rubrisubalbicans strain M1 (wild type) showing tissue system changes associated with extensive colonization of the intercellular spaces of the mesophyll and sub-stomatal cavity (white arrows). Note the chloroplast degradation (black arrow), (vb) vascular bundles, (bs) bundle sheath, (st) stomata. (d) Detailed view of the apoplastic colonization by the wild type M1 (white arrow) and beneath the stomata cavity (black arrow). Note the bacteria surrounded by toluidine blue-stained gums. (ep) epidermis. (e) Transversal section showing TSE and TSN mutants colonizing the leaf blade. Note the plant gums which restrict the intercellular spreading of the bacterial mutants (black arrow). (f) Transversal section of localized areas densely colonized by the mutants (white arrows) showing minor anatomical changes compared with panels (a) and (c). Note the reduced numbers and size of the bundle sheath chloroplasts (black arrow). (g) Transmission electron microscopy of the mutant bacteria colonizing the intercellular spaces of mesophyll cells. See changes in the cytoplasm of the plant host cell in close contact with the bacteria. (pc) parenchyma cells. Three plants of each condition were used for microscopy and the pictures are representative of the three inoculated plants. 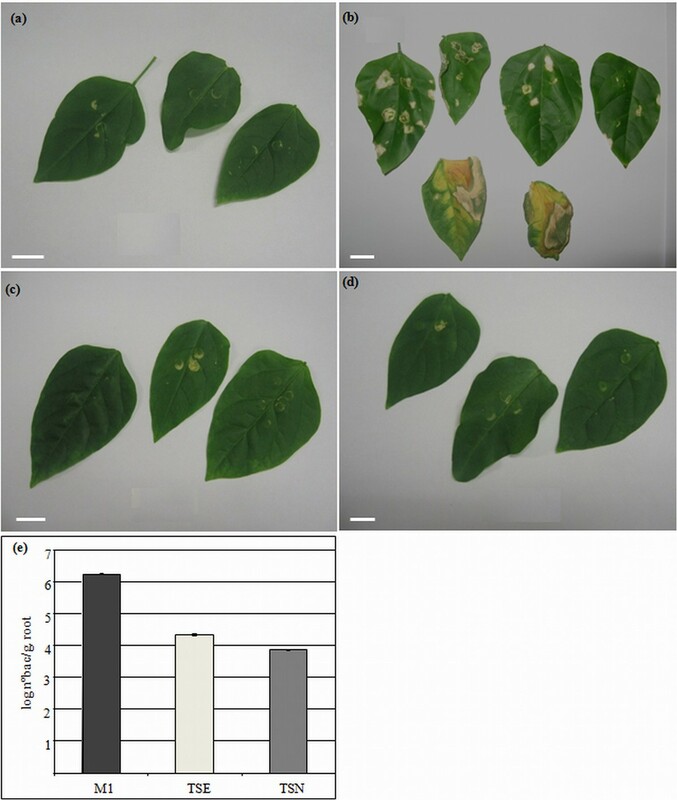 H. rubrisubalbicans hrpE and hrcN mutant strains do not elicit lesions on Vigna unguiculata leaves. To study the effect of T3SS genes mutation in another host, V. unguiculata leaves were infiltrated with H. rubrisubalbicans strains M1, TSE and TSN. Inoculation with H. rubrisubalbicans M1 caused lesions on the leaves. The infiltrated zone showed the first sign of tissue collapse after 48 h of infiltration, and within 10 days the zone became necrotic, surrounded by strong chlorotic halos, followed by leaf loss (Figure 6b). Inoculation of Vigna unguiculata leaves with M1, TSE and TSN strains of H. rubrisubalbicans and recovery of bacteria from internal tissue. V. unguiculata leaves were infiltrated twenty days after germination; the photos were taken 10 days after infiltration. The scale bars are shown (1 cm). (a) Control leaves were infiltrated with 1 mL of MgSO4 10 mM solution. (b) Leaves infiltrated with wild type strain M1 (108 cells). (c) Leaves infiltrated with 108 cells of the mutant strain TSE. (d) Leaves infiltrated with mutant strain TSN (108 cells). (e) V. unguiculata plants were infiltrated with the indicated strains, and ten days later they were superficially disinfected, macerated, the macerate was diluted and plated. The plates were kept at 30 °C for 24 hours and colonies counted. The experiment contained five plants in each condition and repeated on at least three separate dates. Results are shown as means of Log10 (number of bacteria g-1 of fresh root). Standard deviation (Student t-test, p < 0.05). In contrast, infiltration of leaves with H. rubrisubalbicans TSE and TSN mutants did not produce lesions (Figure 6c, d). These data suggest that mutation in hrpE and hrcN genes prevented the TSE and TSN mutant strains from causing disease symptoms on infiltrated leaves. The leaves of V. unguiculata used as controls (Figure 5a) and those inoculated with the wild type M1 and mutant strains TSE and TSN were superficially disinfected, macerated and dilutions were plated. The results show that 106 bacteria/g of fresh weight were recovered from leaves infiltrated with the wild type M1 (Figure 6e), while the number of bacteria from leaves infiltrated with mutant strains TSE and TSN was about 100 times lower (Figure 6e). The decrease in internal colonization is not due to differences in the growth rate since the doubling times of H. rubrisubalbicans T3SS mutant strains in NFbHPN medium are identical to the wild type (data not shown). When Pseudomonas syringae pv. tomato T3SS mutant strains were infiltrated in tomato leaves a reduction in the number of recovered bacteria was also observed [35, 36]. These results further support our findings that the genes hrpE and hrcN are involved in the colonization of V. unguiculata by H. rubrisubalbicans. Mutations in hrpE and hrcN genes reduce the capacity of H. rubrisulbalbicans to colonize rice. H. rubrisubalbicans has been found in roots and leaves of rice  but the interaction was not pathogenic. To investigate if H. rubrisubalbicans hrcN and hrpE genes are involved in such non-pathogenic endophytic colonization, rice seedlings were inoculated with H. rubrisubalbicans strains M1, TSE and TSN five days after germination and the number of endophytic bacteria determined 3, 5, 7 and 9 days after inoculation. No disease symptoms were observed in plants inoculated with any of these bacterial strains. Figure 7 shows that three days after inoculation the number of endophytic wild-type bacteria was 10-fold higher than that of the mutant strains. This difference remained 5 and 7 days after inoculation and increased to 100-fold after nine days. The results indicate that the genes hrpE and hrcN may also be involved in the endophytic colonization of rice by H. rubrisubalbicans. Internal colonization of Oryza sativa roots by H. rubrisubalbicans . The number of endophytic bacteria colonizing internal rice root tissues was determined 3, 5, 7 and 9 days after inoculation (d.a.i.). The plants were superficially disinfected and the roots were cut, homogenized, diluted and plated. The plates were kept at 30°C for 24 hours and colonies counted. Results are shown as means of Log10 (number of bacteria. g-1 of fresh root) ± standard deviation (Student t-test; P < 0.05). The experiment contained five different plants for each condition. This experiment was repeated on at least three separate dates. The type three secretion system of gram-negative plant pathogenic bacteria belonging to the genera Pseudomonas, Ralstonia, Xanthomonas and Erwinia is essential for disease development . Bacteria of the genus Herbaspirillum endophytically colonize plants of the Poaceae family but can also be found in internal tissues of other plants such as Phaseolus vulgaris [38, 39] and soybean (Glycine max) , as well as the tropical species banana and pineapple . Most Herbaspirillum species establish neutral or beneficial interaction with plants [42–49]. H. rubrisubalbicans can establish non pathogenic beneficial interactions with the Poaceae but is also capable of causing disease in some varieties of sugarcane and sorghum [1, 2, 5]. In this report we show that the T3SS of H. rubrisubalbicans is important for establishing pathogenic interactions with sugarcane, lesion formation in V. unguiculata leaves as well as endophytic colonization of a rice cultivar and maize. The gene organization of the H. rubrisubalbicans hrp/hrc cluster is identical to that of H. seropedicae . The T3SS gene cluster of phytopathogenic bacteria can be divided into two groups based on DNA homology, genetic organization, and regulation pattern . The structural organization of hrcUhrpXhrcShrcRhrcQ and hrpBhrcJhrpDhrpE genes in the H. rubrisubalbicans hrp cluster resembles that of bacteria such as Pseudomonas syringae, Erwinia amylovora, and Pantoea stewartii. 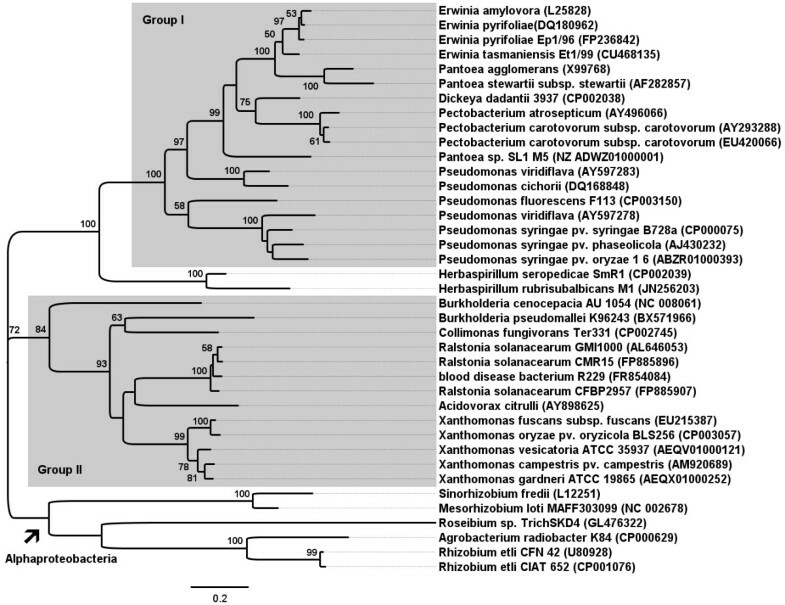 H. rubrisubalbicans also possesses a hrpL gene, a characteristic of bacteria from group I. The HrpL protein, a member of the ECF family of alternative sigma factors, regulates the expression of hrp genes in group I [27, 50, 51]. Interestingly, H. rubrisubalbicans hrpL has no σ54 promoter sequence, a feature conserved in group I organisms, but contains a gene highly similar to hrpG. The HrpG protein is involved in the expression of group II hrp genes [52, 53]. Upstream from orf1, orf6, hrpO, orf8, hrpB and orf10 are conserved sequences that are similar to the hrp box sequences which are recognized by HrpL of P. syringae [27–29] suggesting the presence of at least six HrpL dependent operons. This is consistent with the observation that hrp genes are commonly organized in large gene clusters, consisting of multiple transcriptional units. For instance, P. syringae pv. syringae and E. amylovora contain a 25 Kb cluster with eight transcriptional units . Blast search using the available sequence allowed to identify five candidates for H. rubrisubalbicans effector proteins: Hrop1, Hrop2, HropAV1, HropAN1 and HropF1. Only HropAN1 has a counterpart in H. seropedicae, the other effector proteins are unique to H. rubrisubalbicans and could be involved in the pathogenic phenotype of H. rubrisubalbicans. To determine if the T3SS of H. rubrisubalbicans is functional we constructed and characterized hrcN and hrpE mutants. T3SS-associated ATPases (HrcN proteins) have long been predicted to be the key energizers of the T3SS. The H. rubrisubalbicans hrcN mutant failed to cause the mottled stripe disease in sugarcane variety B-4362, demonstrating that the HrcN of H. rubrisubalbicans is important for bacterial pathogenicity. Similar results were observed in other plant pathogens, such as Xanthomonas oryzae pathovar oryzae KACC10859, whose hrcN mutant completely lost virulence . X. campestris pv. vesicatoria strain 85, whose hrcN mutant failed to induce plant reactions in susceptible and resistant pepper plants , and a R. solanacearum hrcN mutant lost virulence on tomato . The H. rubrisubalbicans hrpE mutant also lost the ability to cause disease. This phenotype might be due to direct loss of the function of this gene or could be due to a polar effect on genes downstream from hrpE. For example, the gene hrcC, which expresses the pore-forming outer membrane protein, is located downstream from hrpE and without the pore the external needle effector proteins remain in the cytoplasm or periplasm of the bacteria. This phenotype has been shown for P. syringae, where the mutant strain in the hrpE gene did not cause a hypersensitive response in plants of Nicotiana tabacum . H. rubrisubalbicans hrcN and hrpE mutants did not elicit lesions on V. unguiculata leaves. Thus, our results point to the involvement of the H. rubrisubalbicans T3SS in the development of disease symptoms in V. unguiculata leaves. Interestingly, the H. rubrisubalbicans hrcN and hrpE mutants were less proficient in endophytic colonization of rice and maize, indicating that the T3SS genes have a dual function depending on the host. In susceptible hosts T3SS expression by H. rubrisubalbicans leads to the development of disease whereas in symptomless hosts the T3SS is important to avoid the plant response allowing bacterial colonization. 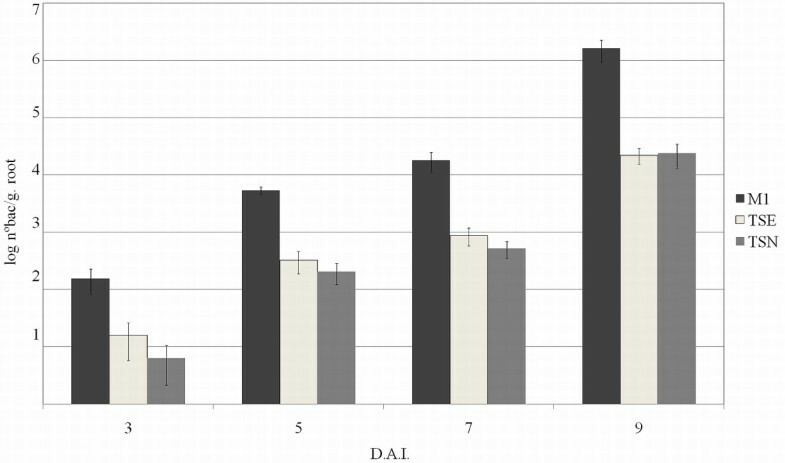 Impairment of the T3SS system also produced opposing effects on different plants inoculated with the symbiotic nodulating bacterium Rhizobium sp. NGR234 . Some leguminous plants are more effectively nodulated by an rhcN (hrcN homolog) mutant strain than by the wild type, while others display the opposite behavior. Molecular analysis of this behavior lead to the characterization of effector proteins as being positive, negative or neutral depending on the effect of their removal . Since H. rubrisubalbicans strains can stimulate growth of some plants  it remains to be determined if the T3SS of such strains can contribute to the beneficial effects. Our results showed that a mutation in the hrpE and hrcN genes lead to a bacterium uncapable to cause the mottled stripe disease in B-4362 sugarcane, indicating that the H. rubrisubalbicans T3SS is necessary for the development of the disease. A decrease in rice endophytic colonization was also observed with these mutants, suggesting that in symptomless plants the H. rubrisubalbicans T3SS is important for endophytic colonization. The bacterial strains used in this study are listed in Table 2. Escherichia coli was grown at 37°C in LB medium . Strains of H. rubrisubalbicans were grown at 30°C in NFbHPN-malate . Antibiotics were used at the following concentrations: tetracycline 10 μg ml−1, ampicillin 250 μg ml−1, chloramphenicol 30 μg ml−1, and kanamycin 50 μg ml−1 for E. coli strains and 100 μg ml−1 for H. rubrisubalbicans strains. Partial sequencing of the H. rubrisubalbicans M1 genome (Monteiro et al., unpublished) revealed the presence of T3SS genes. hrp/hrc gene specific primers were designed to amplify and sequence gaps to obtain the whole sequence of the T3SS gene cluster. DNA sequence reactions were analyzed with an ABI PRISM 377 automatic DNA sequencer (Applied Biosystems, California, USA). Phylogenetic and molecular evolutionary analyses were conducted using MEGA version 5 . DNA sequences were retrieved from GenBank database, translated to amino acids sequences and aligned using Muscle  with the following option differing from default: gap opening −12, gap extension −1, and hydrophobicity multiplier 1. Redundancy for sequences showing less than 0.1 p-distances were eliminated to avoid any bias, then the remaining sequences were realigned. Aligned amino acids sequences were converted back to nucleotide sequences and used to perform phylogenetic analysis. Alignment of protein sequences allow the use of substitution matrix and avoid gap insertion within codons. The Maximum Likelihood (ML) method was used to test the evolutionary models giving best results with Tamura 3-parameters, with gamma-distribute rates and invariant sites model. The selected model was used to build a phylogenetic tree using the ML method with 1,000 bootstrap replicates. Option for partial deletion with site coverage of 95% and a phylogenetic tree built using Neighbor-Joining (NJ) method with Kimura 2-parameter calculated distances and 10,000 bootstrap replicates was used as a start tree for all ML analysis. Edition in phylogenetic tree was made using FigTree version 1.3.1 (http://tree.bio.ed.ac.uk/). Bacterial cultures of H. rubrisubalbicans M1 were grown in NFbHPN-malate  medium at 30°C for 18 h with shaking (120 rpm). Sugarcane variety B-4362 cuttings were obtained from the Program for Genetic Improvement of Sugarcane - CECA/UFAL. These were surface disinfected by treatment with Karate 0.1% and Derosal 0.01% for 2 minutes and heat treatment (immersion in water at 52°C for 30 minutes). Sugarcane inoculation was performed as described . 120 days after germination the stalks of sugarcane were inoculated by injecting with a hypodermic syringe 0.5 to 1 mL of cell suspension in 10 mM MgSO4 (108 cfu mL−1) into the foliar cartridge 2 to 3 cm below the first leaf. After inoculation the leaves were pruned halfway, and the plant was wrapped with a plastic bag to maintain a high humidity environment. Sugarcane inoculated with H. rubrisubalbicans was visually inspected for mottled stripe disease 15 days after inoculation. Vigna unguiculata cultivar Red Caloona seeds were sterilized with 97% sulfuric acid for 10 minutes, followed by four washes with sterilized water . The seeds were germinated in pots containing vermiculite and BD nutrient solution  and cultivated at 30°C with a 16 h light period. Bacterial suspensions (108 cfu mL−1) in 10 mM MgSO4 were infiltrated into the abaxial leaf surface of twenty days old V. unguiculata using a syringe without a needle. The plants were kept in a greenhouse at 30°C, illuminated by sunlight and watered every three days. To determine the number of endophytic bacteria, ten days after H. rubrisubalbicans infiltration, leaves were superficially disinfected with 70% ethanol for five minutes, washed with sterilized water and homogenized with a sterile pestle and mortar in 1 mL of sterile PBS. Leaf extracts were serially diluted and used to determine the number of bacteria colonizing internal plant tissues by plating on NFbHPN-malate. Oryza sativa L. ssp. japonica seeds (variety BRS Formosa) were surface-sterilized with ethanol 70% for 1 min then shaken in 6% hypochlorite and 0.02% tween 20 for 30 min at 30°C, and washed three times with sterile water. The seeds were germinated in Petri dishes containing 1% agar at 25°C for 120 h. Plants were grown in an incubator at 25°C with a 16 h light period and 60% humidity. Thirty seedlings were inoculated five days after germination with 30 mL of H. rubrisubalbicans strains suspension (108 cfu mL−1) by immersion for 15 minutes. The seedlings were transferred to glass tubes containing 20 mL of Hoagland medium  with 0.2% agar and maintained at 25°C, 16 h light period. The roots were cut 3, 5, 7 and 9 days after inoculation, weighed before surface sterilization by a 2 minutes wash with 1% sodium hypochlorite containing 0.01% tween-20, followed by 2 minutes in 70% ethanol, and four washes with sterile distilled water. The samples were then homogenized using a sterile pestle and mortar, and the root extracts diluted in 1 mL of sterile PBS. The number of bacteria colonizing internal plant tissues was determined by plating several dilutions of the extracts on NFbHPN-malate plates. The results reported here represent the average of at least five independent experiments. Standard procedures were performed for plasmid DNA extraction, restriction enzyme reactions, cloning and bacterial transformations [60 or according to the manufactures recommendations]. The genes hrpE and hrcN of H. rubrisubalbicans in plasmids HR02-MF-00-000-009-C05.km and HR02-MF-00-000-053-F11.km (Monteiro and Petruzziello, unpublished) were disrupted by the transposon EZ:: Tn5TM < TET1 > (Epicentre) that confers resistance to tetracycline. The mutant suicide plasmids were electroporated into the wild type H. rubrisubalbicans strain M1. Recombinant cells were selected for tetracycline resistance and screened for the loss of kanamycin resistance (vector marker). Southern blot analyses of EcoRI digested genomic DNA were used to confirm the presence of the tetracycline transposon in hrpE and hrcN. (data not shown). The selected mutant strains, named TSE and TSN, contained transposon insertions into hrpE and hrcN, respectively. Leaves were taken at 21 days after inoculation, washed twice in phosphate buffer (50 mM, pH 7.0) and fixed in 2.5% (v/v) glutaraldehyde (in 50 mM phosphate buffer, pH 7.0). Leaf sections were prepared for light and transmission electron microscopy according to James et al. . This work was supported by the Brazilian agencies CAPES and INCT-FBN/CNPq. The authors thank Roseli Prado and Julieta Pie for technical assistance. Conceived and designed the work: FOP, RAM and EMS. Performed the experiments: MAS, EB, RW, HF, FLO and VAB. Performed assembly, annotation, and bioinformatics analyses: MAS, EB, RW, LMC, VAW, HF, EMS, RAM, HMFM, LPF, MHPF, FMP, LFPP, LGEC. Wrote the manuscript: RAM, EMS, MGY and MAS. Prepared figures: LMC, RAM, EB and MAS. All authors read and approved the final manuscript.